Despite a few slow quarters and many damning predictions, Facebook's future looks bright again based on its accelerated growth on multiple fronts during the third quarter. If Facebook peaked in popularity and is losing momentum, the company sure is good at hiding it. While there's been ample debate during the past few years about how quickly Facebook could decline, this theme of impending doom doesn't jive with the company's latest growth numbers. Roughly two years ago, Facebook warned investors that teens were visiting the site slightly less frequently, and many analysts projected a gloomy outlook as a result. Last year, a group of researchers at Princeton University predicted the site would be all but dead by 2017, and even President Barack Obama said young people "don't use Facebook anymore." Around the same time, iStrategy Labs released a study that suggested a 25 percent decline in teen Facebook use during the previous three years and concluded the company would ultimately decline in value as a result. GlobalWebIndex also said teen use slid dramatically during the same period. 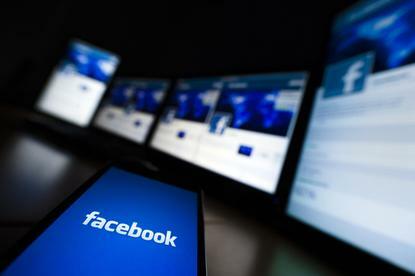 Facebook fought off these potential areas of concern with an impressive turnaround in the third quarter of 2015, and it reported accelerated growth in mobile ad revenue, its user base (monthly and daily active users) and the ratio of users who access the site only via mobile devices. 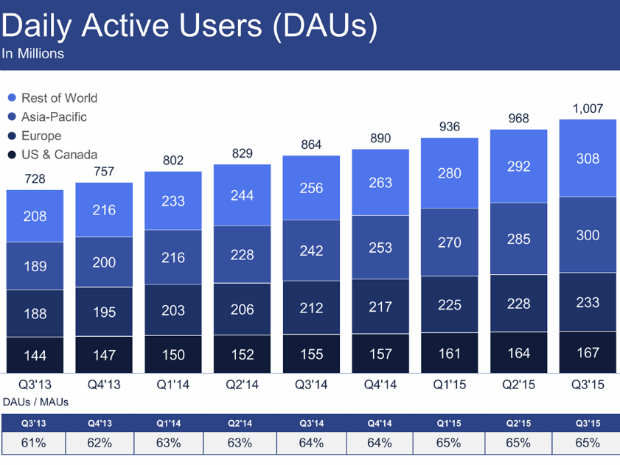 Daily active users (DAU) topped 1 billion for the first time during the period while mobile Facebook DAUs reached 894 million. The company now has a monthly active user (MAU) base of 1.55 billion, up 14 percent from 1.35 billion in in the third quarter of 2014, and daily video views doubled during the past six months to 8 billion. As a point of comparison, the company also added more users in the United States and Canada alone (4 million) than Twitter added globally during the same quarter. 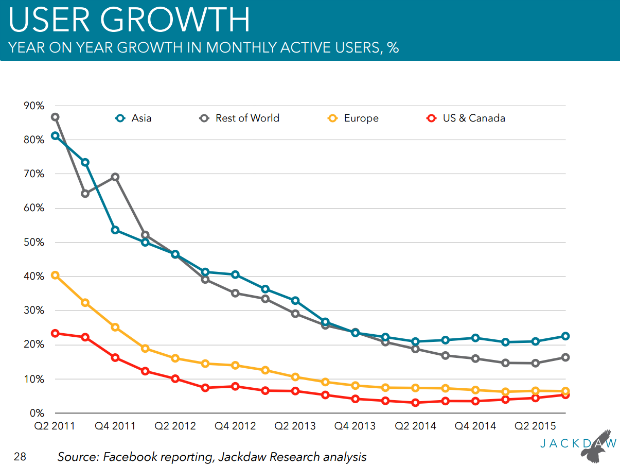 Facebook also mostly turned the tide on the declining teen use. "The reality is that teens may not be spending as much time on it as they were before, but I think very few teens are actually abandoning Facebook altogether," says Jan Dawson, chief analyst and founder of tech research firm Jackdaw. "They probably still count as monthly active users and most of them are still on there probably daily." 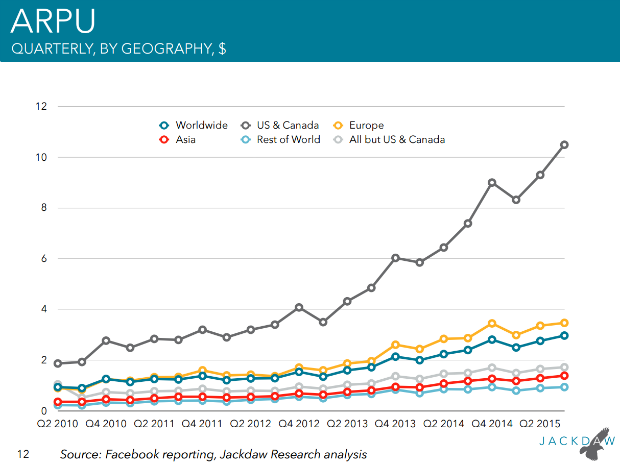 Dawson says most of Facebook's recent growth came from regions where only a small minority of the population uses the service, such as Asia. Company-led initiatives including Internet.org, a collaborative effort with other major technology firms to bring affordable Internet access to "every person on earth," help Facebook grow in the regions where it has the most untapped opportunity, according to Dawson. The company is also developing new ways for people to engage with Facebook in addition to the core Facebook experience, he adds. Facebook growth really started to accelerate about a year ago in Asia, and it has increased ever since, according to Facebook's most recent numbers. Meanwhile, the rest of the world, including the United States and Canada, also saw growth during the last couple of quarters. The company's year-over-year growth in MAUs declined through 2013 and 2014, but it started to again accelerate at the beginning of 2015. "[Facebook] is really just expanding access to the Internet and in the process making people Facebook users at the same time," says Dawson. "A big part of the growth is coming from these regions where people are coming online for the first time and Facebook's capturing them very early in their online lives." 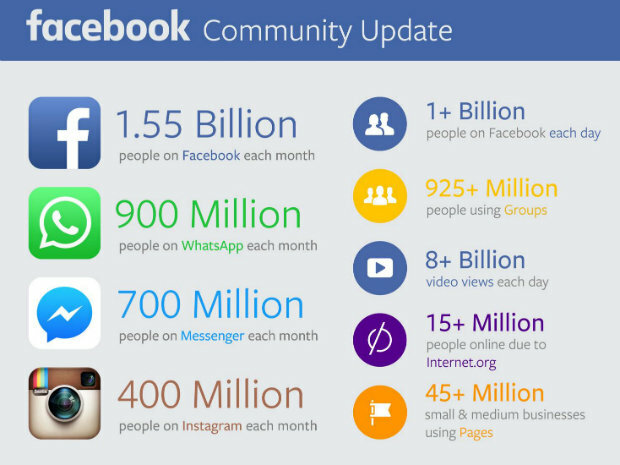 Facebook saw accelerated growth in many important areas, but the company is not infallible. For example, its operating margins dropped to 32 percent, from a high of 48 percent 15 months ago. Desktop ad revenue is down 8 percent year-over-year. And while average revenue per user (ARPU) grew at an impressive clip in the United States and Canada, the company's ARPU didn't fare quite so well in other global regions. "There's this increasing disparity in ARPUs in the United States and Canada versus the rest of the world," says Dawson. The company sees annual ARPU of around $40 per user in the United States and Canada, while most of the rest of the world is in the $5 to $15 range, according to Dawson. "Even in Europe it's far lower," Dawson says. "So there is this question of can they continue to grow ARPUs in the rest of the world or are they just going to start to stagnate at much lower levels, and what does that mean for their long-term growth?" While Facebook no longer suffers from the same challenges as in years passed, the company still faces pressure to show sustained growth. Facebook's numbers are trending upward again as of late, but a few bad quarters could dramatically change the company's outlook. For now, however, the company is firing on all cylinders, with stock at an all-time high and a market cap of more than $302 billion.